Taking one look at these two maps tells you all you need to know. Colorado rocks! Since 1990, Colorado has had the nation's lowest percentage of obese adults. 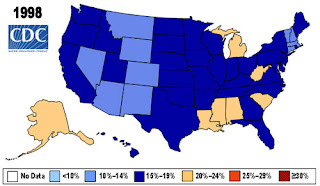 And on the CDC's latest map of adult obesity prevalence, Colorado is the only state shaded in dark blue, because of its low percentage -- 18.7% -- of obese adults. So how does Colorado stay fit and trim while the rest of the nation continues to grow 'wider'? Here are seven nuggets of Colorado's weight wisdom, from James O. Hill, PhD, director of the Center for Human Nutrition at the University of Colorado Denver and co-founder of America on the Move, a nonprofit group focused on healthy lifestyles. "That's the first goal," Hill says. "If we could first keep from getting worse, and then gradually start going down, that would be very, very good." 2. Cultivate a culture of health. "I think Colorado has more of a culture of health than other places," Hill says. "People value lifestyle, they value physical activity, they value healthy eating. We have an environment that's conducive to that. It's a wonderful place for physical activity. " Small changes, that is. "The advice to the rest of the country is ... you aren't going to turn this around overnight and so start thinking about a lot of small changes." Those changes start with behavior -- being more active and eating healthier. Over time, those small changes make a difference. 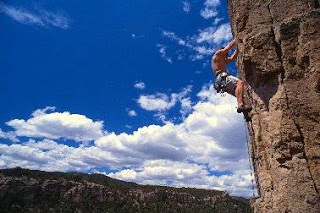 Do your surroundings promote a healthy, active lifestyle, or are they kindest to couch potatoes? "We have a weather pattern where you can be outside pretty comfortably summer and winter," Hill says. But there's more to it than that. "If you're encouraging people to walk more, do they have places to walk? Are there parks? Are employers encouraging walking? On the food side, we encourage people to make better choices. Are better choices available?" Hill says that Colorado is trying to work with restaurants to make meals healthier and portions more reasonable. "The thing that makes Colorado different is that the public, private, and academic sectors tend to be pretty agreeable to working together to try to find a common goal," he says. 6. Put out the welcome mat. Colorado's obesity rate might be getting some help from fit people moving to the state. At least, Hill hopes so. "That ability to live a healthy lifestyle is something that people value," he says. "My hope is that we are beginning to attract people who want to come to Colorado because it's easier to be healthy in Colorado." 7. Have some humble pie. Colorado doesn't have a whole lot of bragging room. 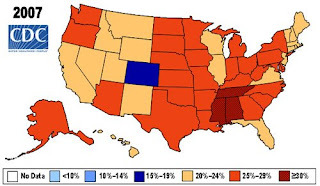 Obesity is on the rise nationwide, and Colorado's adult obesity rate of 18.7% is knocking on the door of the upper limit for the "dark blue" color on the CDC map. "We don't want to get in that next color," Hill says. "I believe with all the efforts going on right now in Colorado, we will stay out of that next color and I wouldn't be surprised if next year, we actually show that rates go down -- probably a little bit, but hopefully in the right direction." Heh. Looks like we've got a weight problem here in Arkansas. Yet another thing to be proud of, yeah? Yeah, unfortunately you're right. I'm just glad we weren't lumped in with Alabama, Mississippi, and Tennessee.